Marketers market at children. Advertisers use and target children. Makers of toys, cartoon shows, and more know that children are a lucrative market. And that if you cannot get to the parents, get to their wallets via children. It may appear to be wrong, and it may militate against our sense of right and wrong, but it happens, all the time. This book attempts to document, expose, and reveal how, when, and possibly why this happens. You can look at the material in this book as basically covering two topics. One is the part that dwells on how children learn, whether watching television lets them learn any better (or worse). 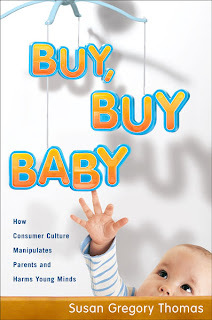 The author also dwells on what drives parents when deciding what to spend on children. The second part is numerous examples of toys, cartoon shows, and franchises that were built into billion dollar businesses through careful branding, advertising, and marketing. Examples are Disney Princesses, Winnie the Pooh, Care Bears, Clifford the Dog, Elmo, and lots more. One of the most useful and fascinating chapters of the book is on the theoretical and psychological insights into how children learn (Ch 3 - 'It's Like Playschool on TV'). The work of such people as Piaget and Vygotsky serve as the basis for much of the material here. To a great extent this book works. But... It is not a masterpiece of muckracking like 'Fast Food Nation'. There is also the sense that the author is unwilling to take a strong stand on this targeting of children, relying instead on the reader to come to that conclusion. Thirdly, the material in the book could have been better organized - themes too often intermingle in the chapters. Lastly, given that marketing to children is built on advertising, a crucial piece missing in this book is the lack of mention of any advertisements that targeted children, so the reader has an idea of the kind of advertising over the years that has targeted children. "In 1978 the FTC issued a report contending that commercials targeting children under the age of eight were intrinsically unethical, since children of that age were developmentally unable to discern the subtle differences between fact and fantasy." Unsurprisingly, depressingly, "The investigation and the report were quashed by lobbying efforts on behalf of the advertising industry." [both page 55]. "Exploiting nostalgia was the advertisers' chief ploy. ... the toy industry understood the draw for parents of revisiting their own youth through their children." [page 56] What would have been very useful here, in this book, if the author had actually cited advertisements that did this. GenX-ers are dealt with in some detail in the book, across several chapters. "... watching Sesame Street was 'negatively related' to expressive language use... Teletubbies was negatively related to both vocabulary size and expressive language use ... Barney and Friends was positively related to expressive language use and positively related to vocabulary size ... "
Feeding children into the advertising and marketing grinder has consequences also, as one would expect. Take the 'Disney Princess' brand for example. "It's good for kids to learn how to manipulate - that's how you get ahead in this world." - per Rachel Geller, big honcho at the Geppetto Group, a New York based marketing firm. 20 pages of notes, and 10 pages of bibliography - fodder for further reading if one is so inclined, ending with a 12 page index.